Azaleas are closely related to rhododendrons, and share the same love of warmth, deep moisture and acidic soil. These plants thrive in Southern states like North Carolina and Georgia, with evergreen and deciduous types. Each type has many different varieties, with different characteristics and life spans. The Christina azalea is a type of Begian Indican Hybrid, and is therefore a somewhat tender plant that does best in greenhouses, where temperature and sun are tightly controlled. This is an evergreen azalea that grows large blooms in bright pinks and reds. Christina azaleas do best with light shade and only restricted sun, to keep them from burning. This is especially true when plants are young. Azaleas require quick-draining soil and organic compost, and prefer acidic soil for full growth and blooming. 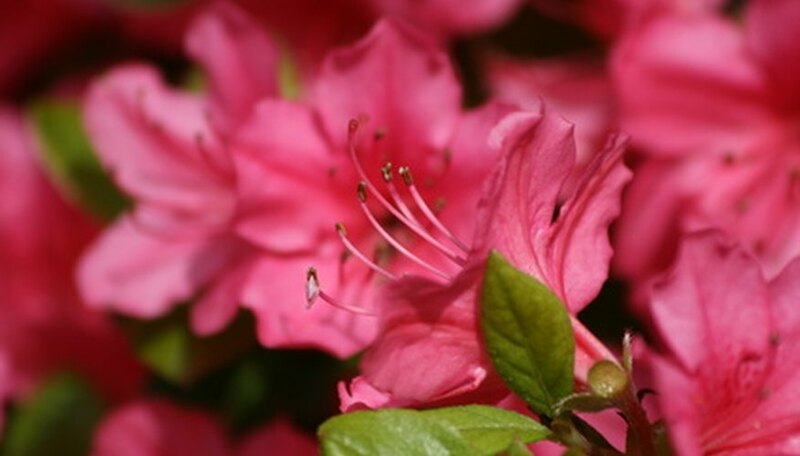 According to the Alabama Cooperative Extension, gardeners should purchase young Christina azaleas when they're 12 to 16 inches tall, to ensure good, healthy stock, and plant the seedlings in spring or fall. A fall planting is best for azaleas, as it gives that plants time to establish over winter for their summer growing season. Like many blooming plants, Christina azalea's growing season is in summer. At that time, the plant blooms and expands, and should be watered and fed but not pruned. Its only pruning requirement during the growing season is for deadheading after blossoming. Christina azalea blooms in early spring, when the temperature warms, and may maintain its blooms through the summer. In fall, the Christina azalea loses its flowers but maintains its leaves for the winter season. Christina azaleas grow to 6 to 7 feet, with an equal spread, at maturity. This is a slow-growing plant, but it can live for 40 years or more with the right care.